Mike Trout is the best player in baseball. Ask anyone who knows anything about baseball and they will tell you so. He’s accumulated more Wins Above Replacement (WAR) than any player at his age in baseball history. He’s won two MVP awards. He can field, hit, hit for power, throw, and run. Those are all five tools. He has reportedly come to an agreement on a 12-year $430 million contract, and the media is describing it as a bargain. I agree with the knowledgeable baseball folks. I think that Mike Trout probably is the best player in baseball. The numbers are staggering. But I have a Mike Trout problem. I need to back up a little so this makes sense. I am a big baseball fan. I watch a lot of baseball. I am a Red Sox fan and live on the East coast, so most of the games I watch are Sox games, but I watch many other teams as well. Unfortunately, I do not watch a lot of West coast games. They are just too late for me. It’s nothing against any of the teams. I work for a living and need to be sleeping when their games are on. 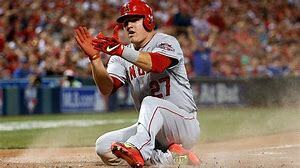 Mike Trout has played his entire career for the Anaheim Angels, which, for the geographically challenged, play on the West coast, severely limiting the number of times I get to see him play. Another factor limiting me in seeing Trout is that the Angels have been a pretty lousy team for the most part since Trout entered the league. That means that they are not frequently playing nationally televised games. I’ll watch if they’re the game of the week, but that doesn’t happen much. So, my big caveat is that I don’t get see Mike Trout play very much. I would guess that I watch him play may five to ten times a year. But, here’s my problem: I’ve never seen Mike Trout do anything amazing. When I do get to see Mike Trout play, he tends to go 1-4, maybe with a walk. He makes a couple of routine catches in center field. And that’s about it. It’s fine, but certainly not what I’m expecting when I watch the greatest player in baseball. I should specify that I’m not talking about highlights. I’ve seen him hit home runs and make diving catches in highlights. But everyone looks amazing in the highlights. That’s what they’re for. I want to see it as an organic part of a game. It’s much more satisfying that way. The same isn’t true of the other great players in baseball. I’ve seen everyone from Francisco Lindor to Giancarlo Stanton to Nolan Arenado to Jose Altuve to Clayton Kershaw to Buster Posey do amazing things. I’ve even seen a lot of lesser players like Yasiel Puig and Jed Lowrie do amazing things. It’s just the greatest player in the game that fails to come through when I’m watching. So, Mike Trout, I’m asking you to change this. Next time I watch the Angels play, go 4-4 with three steals or hit three home runs or make a game saving catch or something. I hope it’s not too much to ask. I just want to see the greatest player in baseball do something amazing.